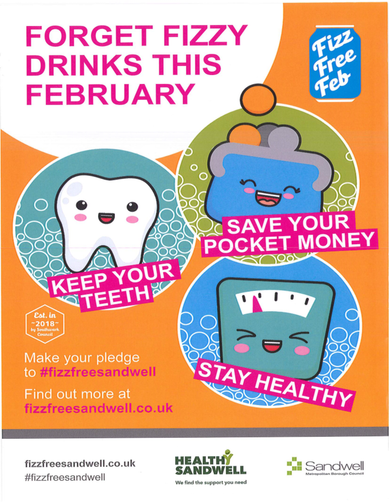 We are hoping you will support us with ‘Fizz Free February’ a Sandwell Health campaign. We’re encouraging pupils, parents, families and staff to take part. We're asking children and young people to give up fizzy drinks for 28 days - making it easier for them to cut down for the rest of the year. Going fizz free can help you to save money, stay healthy and have healthier teeth. Have a look at hints and tips about going fizz free and make your pledge at www.fizzfreesandwell.co.uk .